One of the domains where ICTs’ impact on healthcare and social services can be assessed is through the presence of healthcare interactions in virtual social networks, blogs, and portals. The emerging concept of e-health is covering part of this new phenomena, and the task is to make a clear statement of the problem: what are the relevant dimensions and the impacts of new technologies and practice in health and social services, and how this is changing the present business model in these industries? The present chapter deals with three main issues. The first is the Concept of E-health. The second issue is related to the Healthcare online social networks. In this domain, the authors consider that it is important to distinguish different types of networks, taking into consideration their aim, since they will have different implications both for business as usual and for strategic purposes of different healthcare services’ providers. 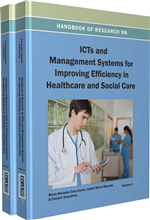 Finally, the authors assess the ICTs’ impact on healthcare in the domain of e-business. By integrating these different concepts, they demonstrate how ICTs directed to healthcare are changing the underlying structure of healthcare businesses, supplying new business models, and becoming a driver for change and productivity gains, while contributing to infrastructure and skill development to healthcare. These changes are posing interesting strategic challenges to the healthcare sector that is worthwhile to consider and equate in light of the conditions required for success. The concept of e-health has several definitions according to the context, perspectives and aims of study and consequently it is difficult to encounter a universally accepted definition. The aim of this first section is not to propose a base-definition of e-health. Instead, we intend to analyse its main constitutive elements. One of the reasons that explain the variety of e-health definitions has to do with the concept itself which integrates multiple dimensions. Health does not mean just the absence of illness. Illness can induce an individual creative reaction that results on a healthier situation. To accomplish this reaction an individual “…must be flexible, one should have different options to deal with the social and economic system” (Capra, 1982: 316). Individual health depends on the type of relation one establishes with himself and with his social and economic system. By means of learning capacity an individual preserves his “… autonomy and is able to deal with larger systems” (ibidem: 317). Integrating complexity and multidimensional questions in health definition, Word Health Organization considers health promotion as “... the process of enabling people to increase control over, and to improve their health. To reach a state of complete physical, mental and social well-being, an individual or group must be able to identify and to realize aspirations, to satisfy needs, and to change or cope with the environment. (…) Health is a positive concept emphasizing social and personal resources, as well as physical capacities.” (WHO, 1986: 1 - chapter 1). Strategic Management: Systematic study of the factors associated with customers and competitors and the organisation in order to provide the basis to rethink and rebuild the current management practises by achieving better alignment of strategic priorities and corporate policies. General Purpose Technology: Technology that initially has much scope for improvement and eventually comes to be widely used, to have many uses, and to have many Hicksian and technological complementarities. Virtual Networks: An interconnected group of networks that appears to the user as one large network. Virtual networking regards the ability for users to communicate across similar and dissimilar networks through a consistent and simple interface. Information and Communication Technologies: An umbrella term that includes either communication devices or applications (e.g. radio, TV, cellular phones), as well as hardware (PCs and networks, or optical fiber cables) and software, satellite systems, and also the various services and applications associated with them. Online Social Networks: Systems that allow members of a specific site to learn about other members’ skills, talents, knowledge, interests, or preferences. E-Business: Applications of information and communication technologies in order to support business activities. E-Health: An emerging field in the intersection of medical informatics, public health and business, referring to health services and information delivered or enhanced through the Internet and related technologies.